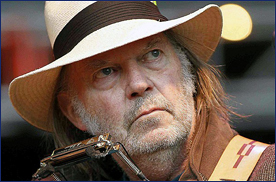 TEL AVIV, Israel (VIP-NEWS) — The veteran rock singer, Neil Young, has cancelled a concert in Israel amid fears it could be targeted by Palestinian militants. Hundreds of rockets have been fired into Israel from neighbouring Gaza in the last week with Israel carrying out a number of air strikes. Tel Aviv police said the cancellation was because of the security risks. A spokesman for the Canadian singer said the show was pulled "with heavy hearts and deep sadness". In a statement on music website Pitchfork, Young`s spokesman said the concert could not go ahead "due to tensions which have rendered the event unsafe at this time". It added that Young would miss the opportunity to play for his fans and looked forward "to playing in Israel and Palestine in peace." About 30,000 tickets had been sold for the concert, which was scheduled to go ahead on 17 July in a Tel Aviv park. It would have been the first time Neil Young, and his band, Crazy Horse, have performed in Israel since the 1990s. Palestinian officials say 172 people in Gaza have been killed since Israel launched Operation Protective Edge against Palestinian militants last Tuesday. Israel says nearly 1,000 rockets have been fired from Gaza in that time. Young himself issued a statement saying he would "be making donations to both the Louise & Tillie Alpert Youth Music Centre of Israel, and Heartbeat, two organizations that teach music to Palestinian and Israeli youth simultaneously by enabling them to play music together."